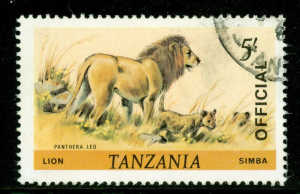 The first set of Tanzania postal stamps were issued on July 7th, 1964. The set marked the union and were inscribed with ‘United Republic of Tanganyika & Zanzibar’. Two of the first four stamps portrayed a map of the coast: one portrayed the coast from Tanga to Dar-es-Salaam and the other along the coast from Zanzibar to Pemba. The other two set in the series depicted two hands holding a torch and spear. 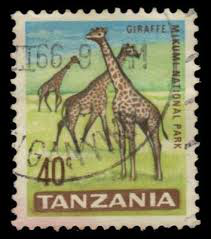 The first stamps inscribed with Tanzania were issued on December 9th, 1965 but were not valid in Zanzibar until 1968. This wa5s the first definitive series of stamps and consisted of a set of values ranging from 5 cents to 20 shillings. Majority of the images on these stamps depicted a variety of natural scenes, symbols and reflected the wildlife in the region, similar to the themes of Zambian stamps. Some early collectable series include a definitive series issued on December 9th, 1967 and the stamps featured various fish from the region. 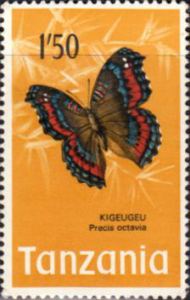 Another series of 15 stamps was issued on December 3rd, 1973 and depicted butterflies. In 1976 and 1977, Tanzania shared eight commemorative sets of stamps with Kenya, after which Tanzania went back to issuing its own set of designs.